Mr. Hong Suk-Woo, minister of South Korea's Ministry of Knowledge Economy, speaks at KHDI breakfast forum held at Lotte Hotel in downtown Seoul on March 15, 2012. "Cooperation between small businesses and big corporations is vital to the further growth of Korean economy," argued Mr. Hong Suk-Woo, minister of South Korea's Ministry of Knowledge Economy at a forum recently held in Seoul. At the breakfast forum hosted by the Korean Human Development Institute (KHDI) on March 15, 2012 the minister laid out some suggestions to beef up the size of the Korean economy. "Last year Korea's trade volume passed 100 million US dollars, which made South Korea the ninth nation in the world to attain the level," Hong said in his speech. "But, to realize the goal of 200 million US dollars of trade volume, we need balanced cooperation between small companies and business conglomerates, active proceeding of free trade agreements, and export of our nuclear power plants," Hong said. "Coincidentally today is the day the South Korea-US FTA goes into effect, and I expect the free trade agreement will be very helpful to our economy on the long-term basis," he went on. Mr. Hong said that he visited the site of the nuclear power plants being constructed by Korean experts in the UAE. "Aside from the astronomical amount of earnings from the construction of nuclear plants there are lots of added values to that," Mr. Hong said. "Some 2,000 Korean professional workers will be needed in the UAE in 2017 when the fist plant gets completed," Mr. Hong predicted. Mr. Hong also stressed the need for convergence of different industries to bolster the competitiveness of Korean businesses. Who Is Mr. Hong Suk-Woo? Mr. Hong Suk-Woo has spent decades of his public service particularly in the field of business and economics. 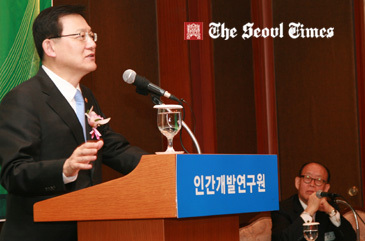 As of March 14, 2012 Mr. Hong has been serving as minister of South Korea's Ministry of Knowledge Economy since Nov. 17, 2011. Mr. Hong is known to be a humble and an industrious government official who always tries to interact very well with his fellow government employees. Unlike other high-level officials Mr. Hong always takes time to exchange Email letters with his workers. The frugal official also enjoys drinking the crudely brewed rice wine of makolli with them. Before Mr. Hong was inaugurated as minister of knowledge economy he was serving as Korea Trade Investment Promotion Agency (KOTRA). From 2008 till 2010 Mr. Hong was in charge of Small and Medium Business Administration (SMBA). He briefly served as a professor at the Sungkyunkwan University in Seoul. The elite government official graduated from prestigious Seoul National University with a major in international economics. He also studied at Harvard University, receiving a master's degree in government administration from it. He earned his doctor's degree in government administration from South Korea's Sungkyunkwan University. Previously Mr. Hong received a presidential award from South Korean government and a Governor's Award for Civil Service from the States of Maryland in the States. Upon graduation from the Seoul National University he became a government official. For this he had to pass the cut-throat high-level civil service examination by the government. He spent most of his career at the Ministry of Knowledge Economy, formerly the Ministry of Commerce, Industry, and Energy (MOCIE). But Mr. Hong has about five years of overseas experience during the long years of his public service career. He spent three years at the United Nations Conference on Trade and Development (UNCTAD) headquartered n Geneva, Switzerland and he also spent two years at the South Korean Embassy in Washington DC. He was born on June 17, 1953.